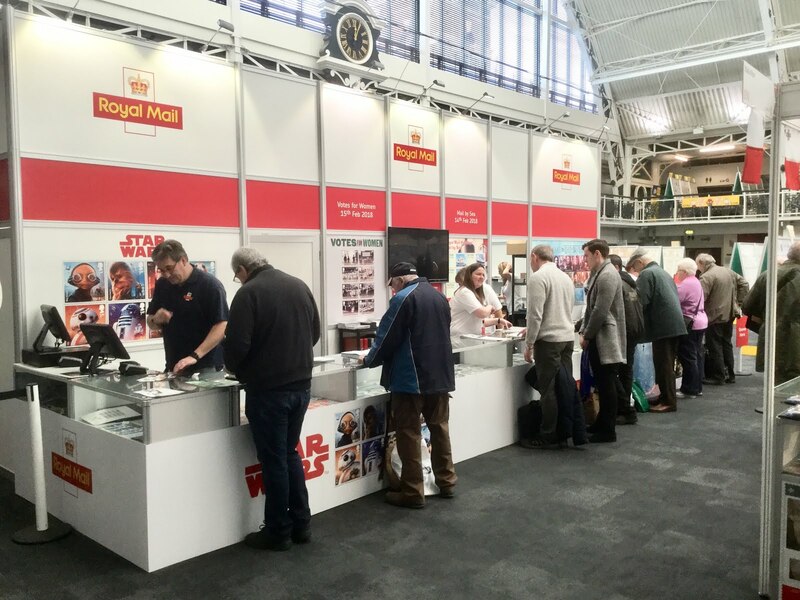 As I mentioned at the beginning of this month, this Stampex was always going to be a 'different' affair as far as customers to Royal Mail's stand were concerned and it will, I think, set the pattern for future events. Purchasers of large or bulky products such as albums and framed stamps from the Royal Mail stand will receive free postage and packing and their purchases will be posted on to them after the show. The full range of definitive stamps will be available, as well as special stamps, although not in the quantities that have been available in the past. However, more popular stock will be replenished overnight should that be necessary. Instead of multiple display points as you would find in Waterstones' bookstores, with stock to be selected and taken for payment (or possibly not, such was the lack of obvious security), the new stand was more compact - as a friend mentioned, more like the firework display case of your local retail store, with everything visible but out of reach. Which, to be fair, is much like Guernsey, Jersey, Isle of Man, Gibraltar and Malta at Stampex. 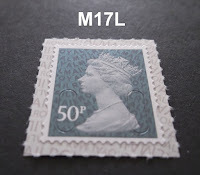 As promised the surprise new M17L printing of the 50p slate-grey was available, though in limited numbers and with few cylinder and date blocks available after dealers had their pick - but plenty of singles and strips. One of our correspondents clearly did not like the new format, as it totally changed the customer experience. The ‘counter’ now doubles up as a glass display counter in which all the products are labelled and priced. Sounds good. But whilst you are being served you can imagine other members of the public are trying to view what’s on offer. The orderly queue gets a bit frazzled. What’s more you are now greeted by a counter clerk with a spiral notepad who will take your order. However, don’t ask for anything complex (like 2017 2p with security printing) as it takes a long time to write down. Doing about 2 or 3 items at a time is about all they can cope with. If you do find something they have nowhere to put it as the counter has no space and there is no shelving. So the items you have managed to get are constantly being handled and taken back and forth to the back room where all the stock is kept. Payment time is also a challenge. You have to go to an end position where the tills are arranged. That said, I am also dismayed about the stocking. No better than my local post office. The booklets are all 2016, I was told that the cellophane wraps on the 1st class and the large are all 2016. There were no 2p or 10p 2017 and the ‘Signed For’ were 2015. And I think that last paragraph clouds the whole experience. I was told by fellow dealers that there were NO 1p stamps at all, quite a stack of 5p, and very few 10p and 20p - and all that was based on day 1. It is possible that stocks of the 2p and 10p on SBP2 at Tallents House have been depleted to the extent that there are no complete sheets left in stock, so there would be nothing to take to London. That's a possibility: as they are such low values many dealers do not bother to ask for particular positions when buying from Tallents House as whole sheets (for 50p and £2.50) will be supplied more quickly than orders which need someone to cut specific stamps from the sheets. But the last definitive stock list we had (early December 2017) showed stocks of the small signed for stamp from 2013, 2015, 2016 & 2017. For the Large only MA13 and M17L were available. So maybe at least some of those later printings should have been taken to London? The comments above have been passed to Royal Mail to influence their presentation for the Autumn event. All feedback is important! Several new definitive printings were available: frustratingly for some a new printing of the 1st class counter sheet was available on Wednesday, and another one on Thursday! We don't normally stock new printings unless they are new stamps but expect these (and maybe others) to be available to us from Tallents House shortly and we will order if anybody requires them. Please email and let us know if you want any date blocks for these new printings. These will all be SBP2, of one version or another. 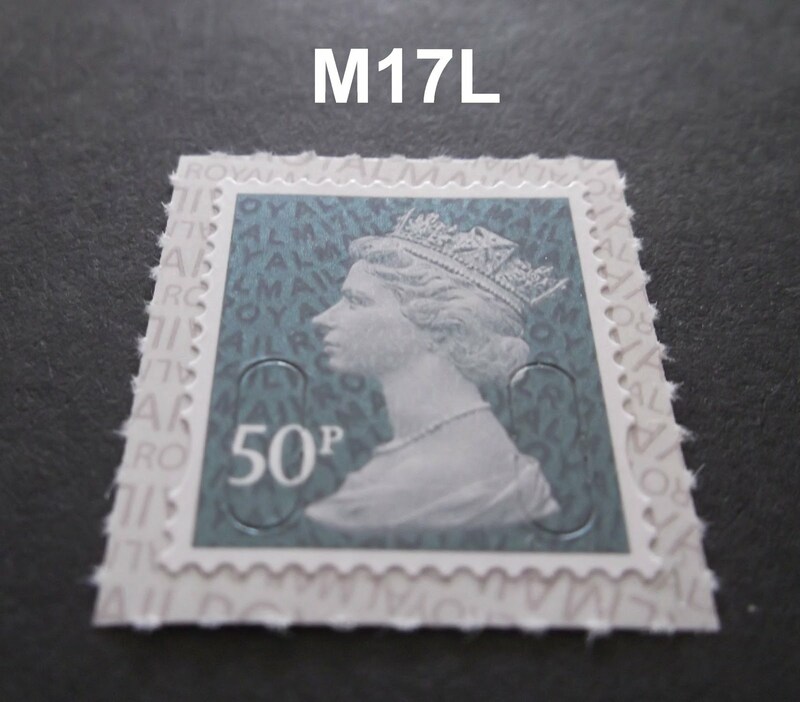 As you know, we don't distinguish or stock the two types as separate stamps. The 50p printing date is 23/10/17 and that will be added to our webshop soon - probably early next week as the weekend is going to be very busy. We will have the SD100g stamp in stock; if anybody requires date blocks for the other new printings, email us as above. There's not much that can be said yet, because of the usual embargo problems, although these are under review (again). Despite a seemingly increasing number of issues, the impact on Royal Mail's revenue streams of income from outside the philatelic collecting area (eg products produced for Star Wars and Game of Thrones fans) will benefit basic collectors who will find some issues will cost less than previously and the range of products on each issue will be reduced. We've already had good news about fewer Post and Go products and the cessation of the Business Customised sheets, and it looks as if there will be only one Royal Mail Commemorative Sheet this year, and Generic Smilers may be restricted to Chinese New Year and Christmas. We also had discussions about their presentation of (first day and other) handstamps, especially relating to the short-notice issues such as Game of Thrones. This will probably see their two webpages (Postmark Bulletins and Postmarks) share links, official First Day postmarks (FD series) shown on the Postmarks page between Bulletins (instead of just the sponsored handstamps), and possibly a new page for the permanent postmarks, some of which the Bulletin helpfully tells you (back page) were last shown in a February 2011 edition! Aside from the 50p for customers, I was pleased to be able to find some modern (QE2) GB postal history, including some rates which really had me puzzled, but which I thought just had to be right. On the train back from London I used the website of the Great Britain Philatelic Society to confirm that. Thanks to the GBPS and Abellio Greater Anglia wifi! I'll be writing about these on my Modern Postal History blog. It was good once again to meet up with collectors (some of them identified themselves as customers, and many as blog readers) and dealers and have a natter, and with the Royal Mail team who, I'm sure, regard me (and some other dealers) as a bit of a thorn in their side. At my time of life and stage of collecting, the social side of Stampex brings more pleasure than seeing the dealers' stands with boxes of face value booklets (where to be fair there must be specialist bargains to be found), and worldwide first day covers at often optimistic prices just yards away from similar priced at 25p. At the other end of the market, of course, there are the high end stands and although I don't collect them it is a pleasure to see blocks of 1d blacks, and fine examples of classic stamps of all periods and countries. And then there are the exhibits. As usual I couldn't but glance at most of them, seeking those most interesting to me, but again, Commonwealth King George V high values fine mint and on cover, classic Channel Islands and more esoteric material like revenues or Austro-Hungarian postal stationery will, if attractively presented, find an audience. I would recommend spending at least some time there. Finally, and of direct interest to collectors (and sellers) of Australian material in particular, it was good to see Torsten Weller representing Abacus Auctions, taking over the stand allocated to Mossgreen Auctions who have gone into administration. I did visit the RM stand to buy just one item, and it went OK. However, I could see that it wasn't an easy process if one needed to buy a number of different items. Certainly, I watched one of the sales staff taking Smilers sheets out of their sleeves to scan and the handling left much to be desired (almost folded when she was not concentrating but looking away to chat with a colleague). Whilst I was in the queue, there certainly some VERY disgruntled and angry buyers in front of me complaining about the layout/process! A new system that probably needs a rethink, but it must be improved for next time. It's easy to forget, I think, that where we once had the Post Office Philatelic Bureau, we now have Royal Mail Stamps and Collectibles - to me the change of title says it all. The RM staff at Stampex appeared patient, pleasant and helpful where they could be, they just simply didn't seem to have sufficient knowledge of what they were selling. I'm sure that none of the probable hundreds of customers were buying stamps for use - they would be exclusively collectors or dealers. Consequently, a detailed knowledge of the products and customers' needs is surely a prerequisite for the staff. It felt like going to buy a new car, and coming away with one of a different colour with possibly a scratch down the side! You've been sold a car yes, but not what you were expecting. This may appear a bit harsh, but Stampex is a prestigious international event in the philatelic world and should be supported as such by our national postal organisation. Last September, I believe, was the first time that the staff manning the stand were from Doxford rather than Edinburgh, and they had a lot of learning to do. And now the stand is totally different. Remember the old Stock Lists which were printed in easy to read text on plain white or coloured paper? An extra column on something similar to those where you could write in your requirements would become your shopping list. You could even leave it and come back to CHECK and collect later if you were planning a long day. It needn't be as complete as the more difficult to read glossy A4 Stock List they now produce, just have the special issues that are available, and a list of the definitives. The more I think about it the easier it becomes! I visited Stampex yesterday and the PO stand is much worse than previous years. The first item I asked for, the WWII Pretige book of 2017, they didn't have but did offer it post free from Edinburgh. It seems the more RM fleece collectors the less they want to cater for them. There were no queues, more staff then customers, so maybe collectors are voting with their feet with the plethora of issues and the likes of Star Wars and Game of Thrones. "It seems the more RM fleece collectors the less they want to cater for them." We knew - and I had written - beforehand that the take-away stock would be more limited but that other items would be sent on with no charge for shipping. I thought it would only be bulky items but they made it quite clear that they wouldn't take large stocks of everything, partly to avoid wastage, and partly because they would have less room on a smaller (= cheaper) stand. I think it might have been expected that they would be low on stocks by day 4. I went out on the 14 Feb, and just like to say, trying to get one hands on the new P/G Stamps, well, Hull Post Office- trying to get P/G Mail Ships stamps, no, no Ships stamps in the machines in Hull, in the afternoon,(they did not send us any? ), so I went to Doncaster, the new Doncaster P.O., a very late delivery of the stamps, late afternoon, it looks like there problems out there?, but up the road in York, no problems, FDC covers, stamps in the machines, great. it looks like RM do not want to cater for collectors out there? I suspect complaining to PO customer services will do very little good, although all POs should have an arrangement to send FDCs /pouched/ to nearest SHC. Email me and I’ll send you a number for Mount Pleasant SHC, and some ideas.